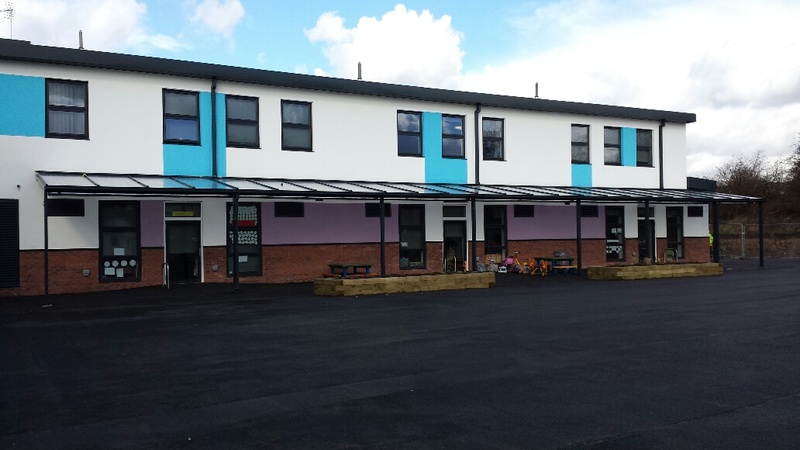 We have recently installed over 82m of fabricated lean-to and cantilever canopies on four areas at the new Flowery Field Primary School in Hyde, Cheshire. 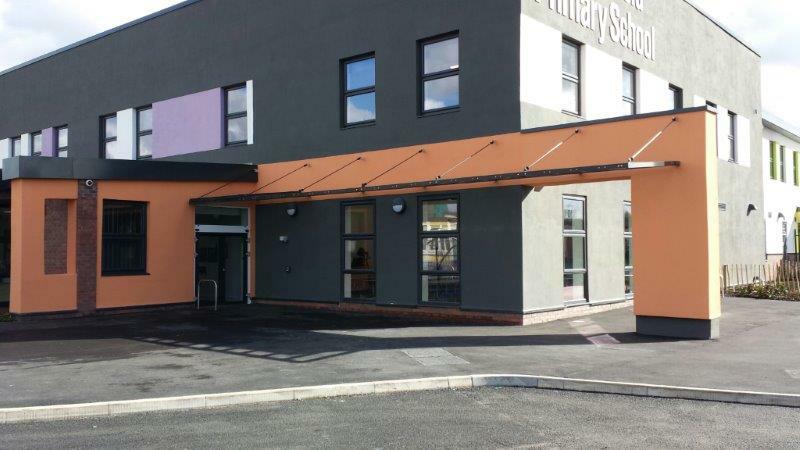 Working for main contractor Interserve we designed, manufactured and installed canopies in widths varying from 2m up to 4m. 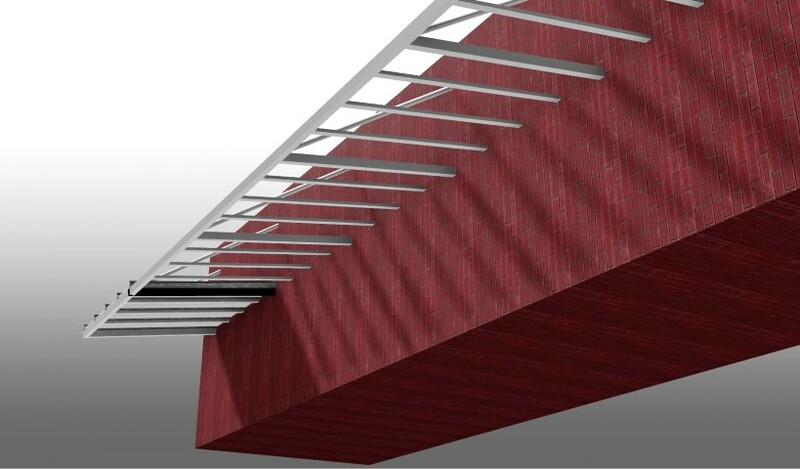 JM Architects requested that the 12.5m entrance canopy have a dual purpose. 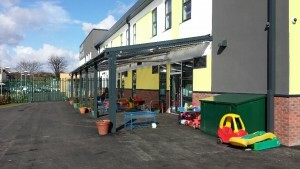 The first 2m element of this 2m wide cantilever canopy was glazed with 6mm solid polycarbonate to provide shelter near to the door whilst the remaining structure was left unglazed with the aluminium rafters providing a cost-effective brise soleil solution of providing shade to the adjoining rooms. 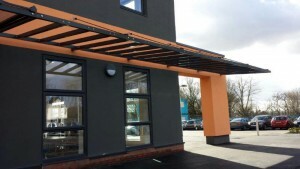 This particular canopy was installed in two phases. We fitted the wall brackets at an early stage of the build and then completed the canopy installation some six months later once the final orange render had been applied to the outer walls. We had originally put forward several layouts for this canopy and the chosen design included deep rafter bars with the overall cantilever roof also being supported by seven steel tension rods. 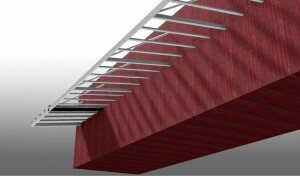 The other three canopies were a fabricated lean-to design, either 3m or 4m wide, fitted with mono-pitched roofs. 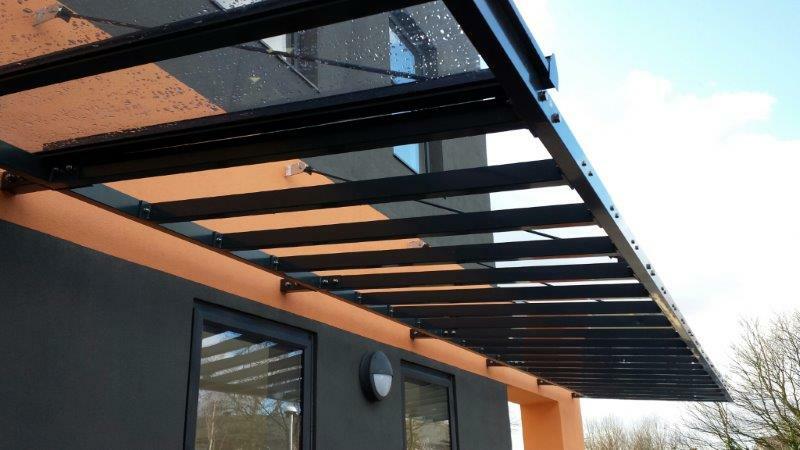 These were glazed with 25mm clear multiwall polycarbonate fixed into our Multi-Link-Panel NF, a system that conforms to the HSE’s recommended drop test, ACR[M]001:2014 with a B designation, indicating that they are classified as non-fragile. 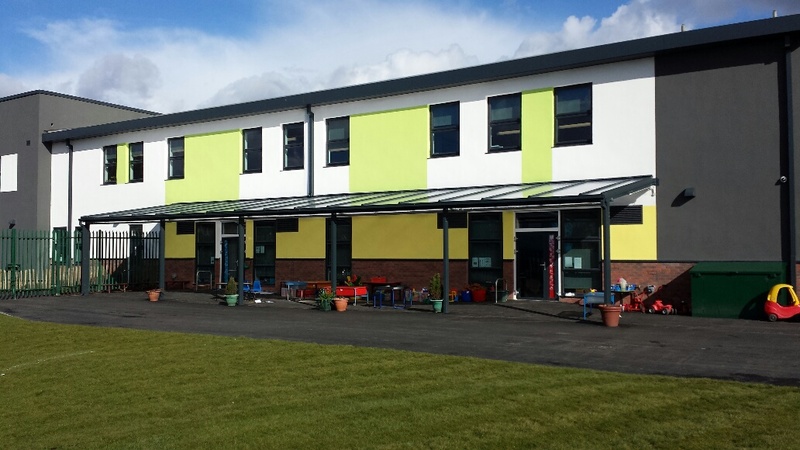 The 25mm multiwall product is ideal for use near to classrooms as its complicated internal ‘X’ structure helps to remove the ‘drumming’ sound that heavy rain can cause on thinner versions of multiwall polycarbonate. 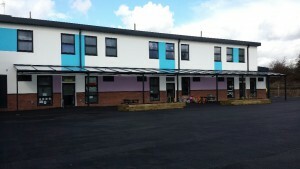 Varying in length from just short of 20m right up to nearly 30m the three canopies were sited adjacent to classrooms where they enable direct and easy access to the various playgrounds and outside areas round the school. All the canopies were powder coated in RAL 7016 anthracite grey. 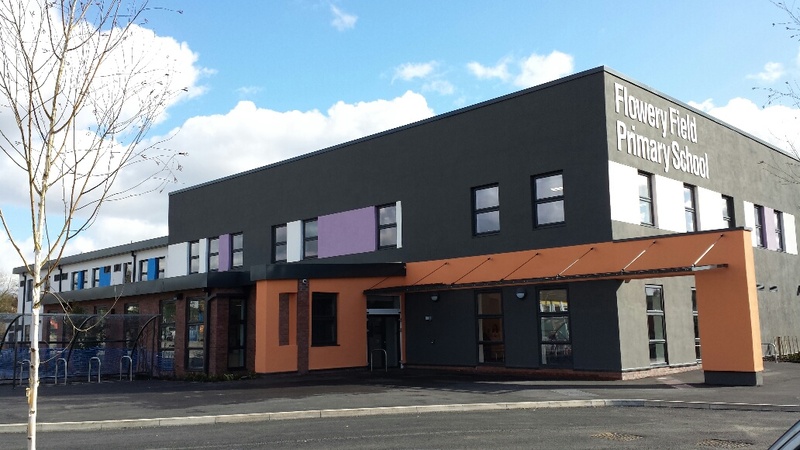 The architect’s choice of colour was included in our overall price at no extra cost, as is our standard practice. 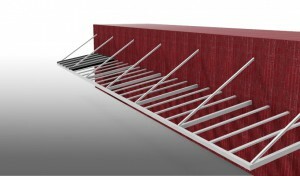 Fitting was carried out by one of our in-house installation teams, who are all DBS checked. 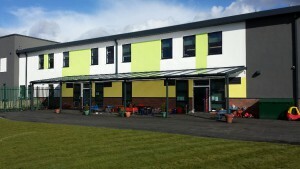 Our own aluminium rainwater goods were also specified for the canopies. The design of the down pipe fitting means there are no convenient hand holds available for small people to be tempted to try and climb up! In order to demonstrate exactly how these would look we prepared a sample of the system for approval prior to manufacture. The fact that all the rainwater goods were powder coated in the same colour as the canopy means they blend in well and being aluminium they won’t rust in use and will have a very long life. 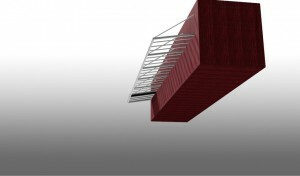 We are currently in discussion about a further canopy on the site. 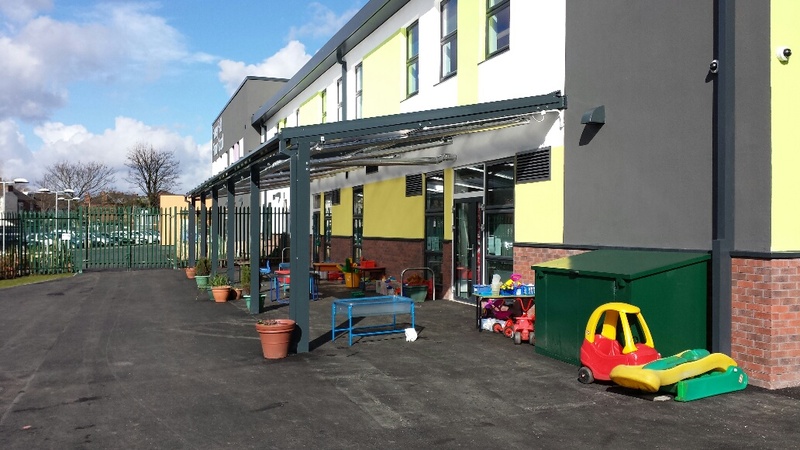 It seems that four wasn’t quite enough for the school and they are now considering another canopy run outside other classrooms!